We present the results of spectroscopic and photometric studies of a new polar CRTS CSS130604 J 215427+155714, conducted at the telescopes of the SAO RAS. Analysis of the photometric series of observations allowed to clarify the orbital period of the system, P o = 0. d 0672879 (±0.0000003). We build radial velocity curves and trace the intensity variations in the Hβ and Hγ hydrogen lines and He II λ 4686 ˚A ionized heliumline. Based on the Hβ and He II lines we build Doppler maps. It is shown that the line formation region is localized near the Lagrange point. The following parameter estimates of the system are obtained:M 1 = 0.83 ± 0.10M ⊙, M 2 = 0.15 ± 0.01M ⊙, q = M 2/M 1 = 0.18 ± 0.03, i = 53◦ ± 5◦. Based on the results of spectral, photometric and previously published polarimetric observations the possible geometric model of the system is discussed. Original Russian Text © N.V. Borisov, M.M. Gabdeev, V.V. Shimansky, N.A. Katysheva, S.Yu. 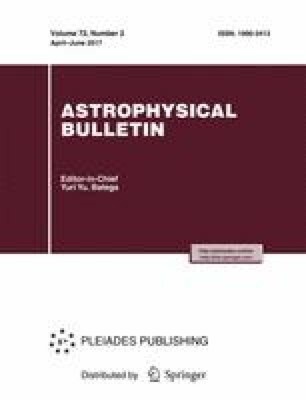 Shugarov, 2017, published in Astrofizicheskii Byulleten’, 2017, Vol. 72, No. 2, pp. 204–211.